Governor Pawlenty had an emergency lunch on Friday...How do I know? 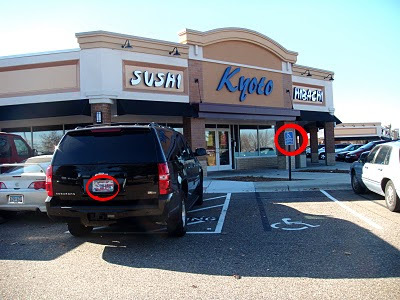 Well his car was parked in the 'Do Not Park' zone for 'handicap' parking - van access- all during his lunch at Kyoto's in Eagan. There was 'pawlenty of open parking' but apparently, the governor likes to keep his driver close...I'm guess in case of emergencies...although two spaces down was an open 'legal' parking space. hmmm... Wonder is that's just another government office perk? Timmy sat with another suit, at a window table. I didn't see who picked up the tab for the 'business lunch' that spanned over an hour. Must be nice being king. Note to Pawlenty: The Minnesota's Driver's Manual can be downloaded online and at no charge. To obstruct handicap parking spaces is to break the law. In Minnesota to be eligible for handicap parking you must meet one of the following eligibility (note that governor is not considered a handicap): To be eligible for a disability parking certificate the applicant must meet one or more described definition(s) of a "physically disabled person". Determination of eligibility is based on the physician or chiropractor's signature, ah, but surely the Minnesota Governor knows that? The Governor’s Office needs to explain this. The Minnesota State Patrol provides security 24 hours a day for the governor and his family, both on the road, at the Capitol, at the governor's mansion on Summit Avenue in St. Paul and at the Pawlenty family home in Eagan. There is no excuse for leaving the vehicle parked infringing on the ability of a handicapped van from being able to open it’s doors for over an hour. A common complaint that I have heard from handicapped drivers is their inablity to get into theier parked van because other drivers parked too close … that’s why they have the slanted lines marking it as handicapped. Governor Pawlenty needs to make a symbolic offer of restitution to the state coffers for illegal actions of his staff. It's pretty obvious that Gov Paw doesn't care about the disabled. Just look at how he's cut program after program that helps them! This man needs to be removed from office because of the he's harm he's doing. Period, end of story.